You pick the parts. They build it and ship it. NZXT makes building a PC hassle-free for those still want the option of choosing their own components. There is a specific satisfaction to booting up a PC you built yourself for the first time. Everything correctly connected, the RAM sticks inserted into their slots all the way, your cooling solution firmly secured over the CPU, the cables tucked neatly out of the way. Accomplishment has never felt so sweet. But building your own gaming PC takes time, especially if you're building one for the first time. While I feel every gaming PC enthusiast should build their own system at least once, there are certain groups of people who would benefit from a build service like BLD by NZXT. Maybe you're a working parent with children. Maybe you want to surprise a loved one with a custom gaming PC but don't have the time (or know how) to put it together yourself. NZXT's BLD service starts you off with the basics, but allows you to fine tune and customize every component to fit within your budget. It's designed with every kind of PC gamer in mind, whether they're intimately familiar with PC hardware, or completely new to the whole world of PC gaming. To start designing your custom rig, BLD will ask you to choose up to three games that you regularly play or want your system to be able to play. The games on the list are generally both processor and graphics intensive games, like Shadow of the Tomb Raider and Far Cry 5. If you don't see the game you want on the list, you can choose one with similar specs or fill out the form at the bottom to recommend one be added to the mix. You also have the chance to select your resolution preference, 1080p or 1440p, which will further help the system recommend what you should be aiming to build. What about 4k? Apparently that's not part of the current spectrum for BLD. All that's left is to pick your price range, either an Intel or AMD processor, and then bam! The system spits out a few recommendations, listing the key specs. This initial part of designing your custom rig takes under two minutes. You don't need to do any further investigating as to the compatibility of components because BLD by NZXT takes out all the guesswork. No more searching through websites like PCPartPicker. NZXT does it for you by narrowing down an overwhelming list of components into several manageable choices, something even the most aficionado of PC aficionados can appreciate. Say you want to play Call of Duty: Black Ops 4, Fallout 4, and Far Cry 5 at 1080p on Ultra, within a price range of $1,500, BLD will recommend the best parts to make the best build at that price, which will always include one of NZXT's cases. But if you have a bit of wiggle room in your budget and want to customize things a bit further, you have two options. The first is to click on either the lower price builds button or the higher price builds button to see what other options you have before checking out. The second is clicking on the configure button to completely fine tune the components to exactly what you want. 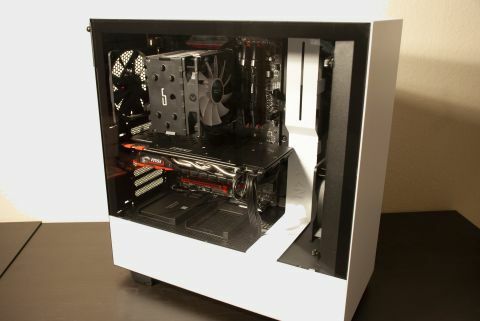 This second option is great for the experienced PC builder who is short on time to build a rig themselves, but knows exactly how they want to design it. Every price for every component is listed alongside it, so there's complete transparency about what you would spend if you bought all the hardware separately. I also saved money by buying the non-RGB version of certain components, because while RGB is nice, it doesn't affect performance. (When you're on a tight budget, you sacrifice some beauty for practicality.) I also went with an air cooling option that would still allow me to do some basic overclocking. The MSI X470 motherboard was a good option for that too, and I saved a little bit more money by getting a motherboard without onboard WiFi. All in all, nothing crazy. Windows 10 Home Edition also comes standard with every build, but you have the option to upgrade to Pro if you want. Oh, and the build fee for someone to put this sucker together? Only $99. The PC was built and shipped within 48 hours of my ordering it, and arrived professionally packed and assembled, complete with every user manual and extra cables for all components. There are even instructions on what order you should plug in your peripherals, complemented with numbered stickers by the ports. The entire building experience had been easy and fun up until this point, but how was the rig I designed going to run? How was it going to handle our benchmarking suite? What if I completely screwed it up? Thankfully, my anxiety-brain was worried for nothing. Running at 1080p on ultra, Shadow of the Tomb Raider averaged 87 fps, while Total War: Warhammer II averaged 77 fps in both battle and campaign modes. The more demanding skaven mode came in a little under at 67 fps. The GPU was definitely pushed to its limits Tom Clancy's Ghost Recon: Wildlands, but that was expected since it's a graphically-intensive game, and the in-game benchmark averaged 58 fps on ultra. Given that I specifically designed this rig for 1080p, I did not test on 1440p or 4K, but I still ran those benchmarks in 3DMark. Not surprisingly, the system clocked in at an average of 10,004 on Fire Strike Extreme (1440p) and at an average of 5,392 on Fire Strike Ultra (4K), or a combined test of 22 fps and 13 fps, respectively—not all that great. But when I started designing this PC, the games I selected at the beginning of the process were Call of Duty: Black Ops 4, Overwatch, and World of Warcraft, all recommended to be played at a minimum 60 fps. So, how was it playing those games? BLD by NZXT does not steer you wrong when it comes to picking out the right hardware for the job. Black Ops 4 and Overwatch both played as smooth as can be on ultra (or the highest equivalent), making the only frustration in the game the zombies or enemy team. For World of Warcraft, I transported myself to a heavily populated area, Tradewinds market on Boralus, and ran in and out of the crowds. No issues there. Then I tried some dungeons, and everything performed without a hitch. From beginning to end, I don't have a single complaint about NZXT's BLD service. Everything was professionally assembled and worked perfectly right out of the box, and every PC comes with a comprehensive two-year warranty on all parts and labor. If I had to be nit picky about something, it would be that there was no option to create a 4K build at the first stage of the process. Maybe the goal right now is to focus on midrange and high-end builds, not necessarily extreme ones, but if you poke around in the system for a bit, you'll see that you do have the option to put an RTX 2080 Ti or an Intel Core i9-9900K in your build. Either way, there's no shame in using NZXT's service the next time you want to build a custom PC.